Jacksonville’s 80,000 acre urban park system is the largest in the US and four times the size of Manhattan. Tweet This! Jacksonville has 400 city, 7 state, and 2 national parks! Tweet This! 264: Number of bird species found in and around Jacksonville. Tweet This! Ahoy! There are 28 motorized and 41 non-motorized boat ramps in Jacksonville. Tweet This! 38 miles: Length of equestrian trails within Jacksonville. Tweet This! Sleep under the stars with Fido at 450+ pet-friendly campsites in Jacksonville. Tweet This! Take a two-wheel spin on nearly 50 miles of biking trails in Jax parks. Tweet This! 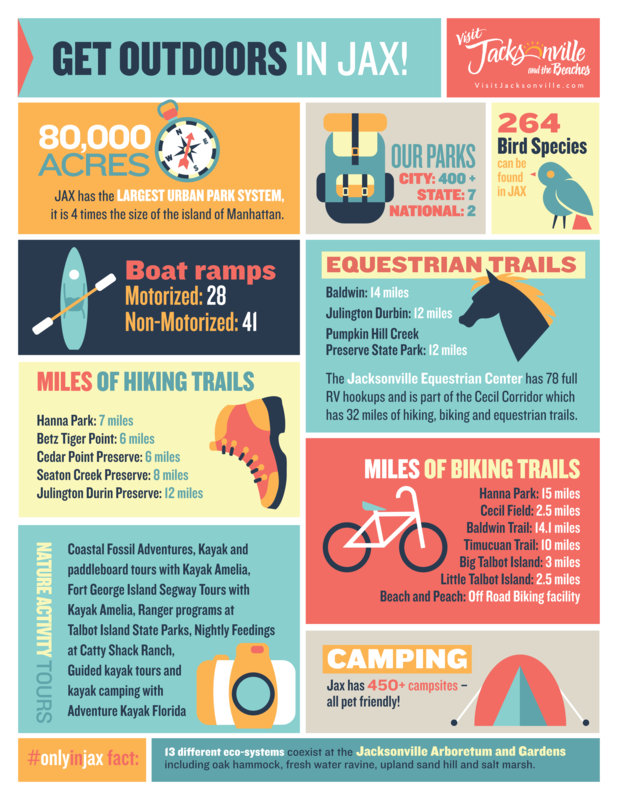 Hike more than 35 miles of trails in Jacksonville parks. Tweet This! 13: Different eco-systems that coexist at the Jacksonville Arboretum and Gardens. Tweet This!